The Holocene extinction, otherwise referred to as the Sixth extinction or Anthropocene extinction, is the ongoing extinction event of speciesduring the present Holocene epoch, mainly as a result of human activity. The large number of extinctions spans numerous families of plants and animals, including mammals, birds, amphibians, reptiles and arthropods. With widespread degradation of highly biodiverse habitats such as coral reefsand rainforests, as well as other areas, the vast majority of these extinctions are thought to be undocumented, as no one is even aware of the existence of the species before they go extinct, or no one has yet discovered their extinction. The current rate of extinction of species is estimated at 100 to 1,000 times higher than natural background rates. In response, Earth Day Network is focusing on fundamentally changing human attitude and behavior about plastics and catalyzing a significant reduction in plastic pollution. Earth Day Network is leveraging the platform of our 50th anniversary in 2020 and is working with key constituencies and influencers in building a world of educated consumers of all ages who understand the environmental, climate and health consequences of using plastics. We are engaging and activating our global network of NGO’s and grassroots organizations, campus youth, mayors and other local elected leaders, faith leaders, artists and athletes, and primary and secondary students and teachers. We are supporting events in all continents of the world, building a global following and activating citizens to join our End Plastic Pollution advocacy campaigns. In sum, we are using the power of Earth Day to elevate the issue of plastic pollution in the global agenda and inspiring and demanding effective action to reducing and controling it. 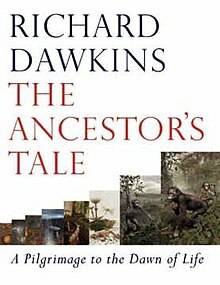 Based on the amazing book by Richard Dawkins, The Ancestor's Tale. Originally this hike was conceived as a walk back in time (as described in the book and inspired by the UK event) from the current time of Humanity going back to the common ancestor's with various other life forms to the origin of multicellular progenitors of animal life around a billion years ago and beyond to the beginning of life on earth some 3.5 billion years ago. We will only be walking the last BILLION YEARS (12.5k) from the dawn of multicellular life in Erindale Park to end with a picnic event and barbeque celebrating our Humanity at PineCliff Drive Park. However, this route has actually been plotted backwards from current time all the way to the beginning of the earth (for reference) which is actually 60k. ending up almost at the Toronto Islands. We may do a cycle ride on that route. Joining the hike along the trail: you do not need to do the whole trail to enjoy the experience. 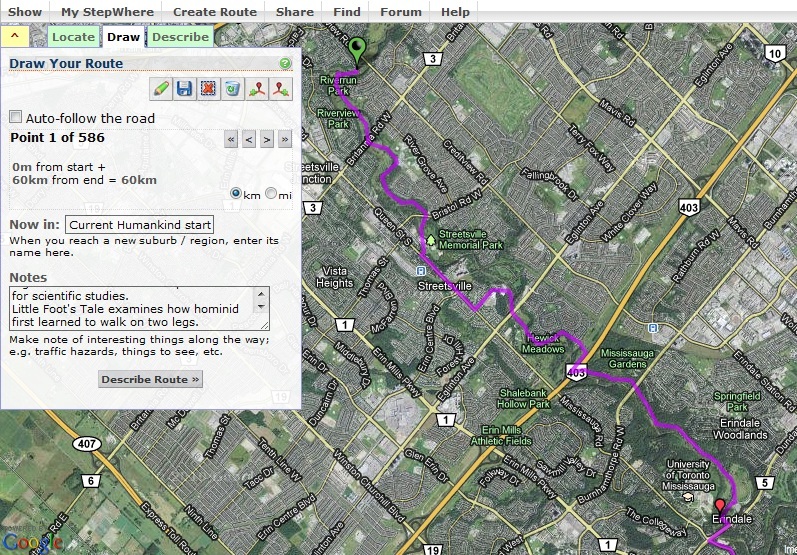 We have provided approximate rendezvous times so that you can join the hike anywhere along the route. Please review the maps below (by clicking on them) to determine the appropriate hiking distance for you and your family. Feel free to bring along the family pet to enjoy this outdoor event. The Stepwhere map gives you the actual distance to the end of the hike or you can also check out our Pledge Instructions page for distances and rendezvous times. Today, as we face one of the greatest extinction of species since the dinosaurs perished 65 million years ago, it is imperative that we understand our common ancestry with all other living species on this planet. We are part of this web of life that is interdependent and an upset in one or a few species can spell doom for many others including ourselves. Apart from anthropogenic climate change, we have also dramatically harvested many wild species of large mammals, fish and sharks which may never recover. Ocean acidification is bleaching coral reefs which are the nurseries for the marine food chain. Tropical and boreal deforestation is reducing the carbon sink essential to keeping CO2 levels from overheating our planet. Understanding the havoc we are creating may help us develop solutions before it is too late. The narrative is structured as a pilgrimage, with all modern animals following their own path through history to the origin of life. Humans meet their evolutionary cousins at rendezvous points along the way, the points at which the lineage diverged. At each point Dawkins attempts to infer, from molecular and fossil evidence, the probable form of the most recent common ancestor and describes the modern animals that join humanity's growing travelling party. This structure is inspired by Geoffrey Chaucer's The Canterbury Tales. The pilgrimage visits a total of 40 "rendezvous points" from rendezvous zero, the most recent common ancestor of all of humanity, to rendezvous 39, eubacteria, the ancestor of all surviving organisms. Though Dawkins is confident of the essential shape of this phylogenetic taxonomy, he enters caveats on a small number of branch points where a compelling weight of evidence had not been assembled at the time of writing. At each rendezvous point, Dawkins recounts interesting tales concerning the cousin animals which are about to join the band of pilgrims. Every newly recruited species, genus or family has its own peculiar features, often ones that are relevant to human anatomy or otherwise interesting for humans. For instance, Dawkins discusses why the axolotl never needs to grow up, how newspecies come about, how hard it is to classify animals, and why our fish-like ancestors moved to the land. These peculiar features are studied and analyzed using a newly introduced tool or method from evolutionary biology, carefully woven into a tale to illustrate how the Darwinian theory of evolution explains all diversity in nature. A highly resolved Tree Of Life, based on completely sequenced genomes. Even though the book is best read sequentially, every chapter can also be read independently as a self-contained tale with an emphasis on a particular aspect of modern biology. As a whole, the book elaborates on all major topics in evolution. Dawkins also tells personal stories about his childhood and time at university. He talks with fondness about a tiny bushbaby he kept as a child in Malawi (Nyasaland). He described his surprise when he learned that the closest living relatives to the hippos are thewhales. The book was produced in two hardback versions: a British one with extensive colour illustrations (by Weidenfeld & Nicolson), and an American one with a reduced number of black-and-white illustrations (by Houghton Mifflin). Paperback versions and an abridged audio version (narrated by Dawkins and his wife Lalla Ward) have also been published. The book is dedicated to Dawkins' friend and mentor, population geneticist John Maynard Smith, who died shortly before the book went to press. Dawkins uses the term concestor—coined by Nicky Warren—for the most recent common ancestor at each rendezvous point. At each rendezvous point, we meet the concestor of ourselves and the listed species or collection of species. This does not mean that the concestor was much like those creatures; after the "rendezvous", our fellow "pilgrims" have had as much time to evolve and change as we have. Only creatures alive at the time of the book's writing join us at each rendezvous point. Except for a few special cases, numerous extinct species and families such as the dinosaurs are excluded from the pilgrimage.